Rookie SHSM senior tour player Shabbir Panni played two days of solid golf in the SHSM finials to finish 3rd place and win enough points to win the 2016 tour. Panni’s two day total of 4 under par earned him enough points to jump up into first place! Richard Bloch won the final event with two days of great golf and an 8 under par score. Bloch moved up from 11th to finish 2nd on the tour. Panni played the last four holes in 2 under par net that included a spectacular natural birdie 2 on hole #16. He not only won a skin by being the only one to birdie the hole among 47 players but it helped leap him into first place. The race for the tour title was so close that if Panni was just one stroke higher over the two days Bloch would have pulled of the largest jump in finals day history and won the tour! John DeWille had a great season but failed to finish in the top 25 for the finals to earn any more points and finished 3rd place. 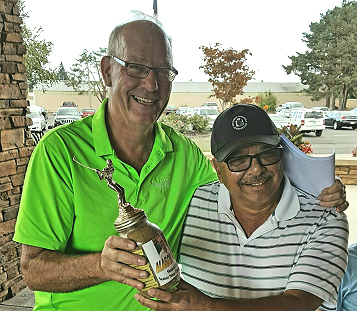 Shabbir was the recipient of the much-coveted “Mason Cup” along with the prestige and golf shop credit that comes with victory! 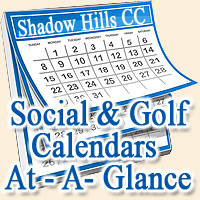 The SH Senior Men’s tour continues to be one of the most popular, long-running golf series at SHCC. 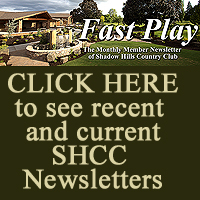 The chance to play every event, or “drop in” as events at home and at SHCC reciprocal courses are scheduled, continues to offer a flexible way to meet others, play competitively, and have a great time! 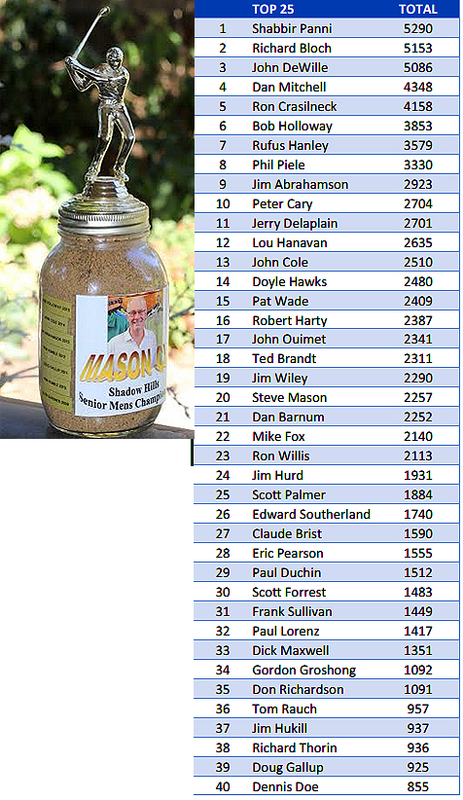 Click More to See Final Results and complete recap!